After dismissal recently, I led a tour of nearby Wolftrap Creek for my school’s teachers. They were interested in learning about this haven for outdoor learning literally across the street from school property. I had offered to lead this tour to my principal two weeks ago. She passed the invite on to teachers, got their RSVPs, and we confirmed the time. So we bundled up on a blustery Spring day and walked over! 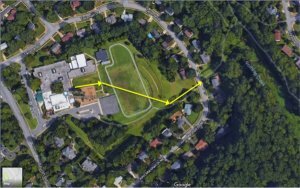 To access the creek, we needed to walk out the school building, past the playground, and across the large sports field to a set of stairs that leads down, off school property to a quiet neighborhood street. We crossed that street and were in the park where the creek is. It took less than 10 minutes to walk there. Wow, were they inspired! They had so many ideas! Reading by the creek, writing poetry, walking mindfully while using senses to observe nature, creating art projects, looking at wildlife – and more. Conservation, science, language arts, math, art, mindfulness – so many subject areas were shared. All to be learned in this local context with meaning in our community. They talked about the idea of getting a permission form signed at the start of the year so that during the year, they could more easily and often go outside to tie specific learning to lessons. They brainstormed that they could inform families ahead of time about specific outings, but save the administrative task of collecting permission slips multiple times a year. I noted that Providence City Schools, RI, already has such a form across the whole district. This makes nearby nature accessible to educators and students. Many of our wonderful teachers live outside of our school zone, so showing them this nearby nature was really helpful.